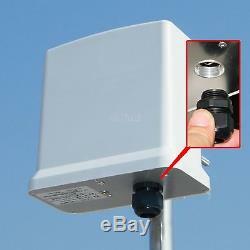 Mars_R2416N 150Mbps 2.4G WiFi Wireless outdoor access point Bridge CPE POE 16dBi Antenna. When you enjoy the sun in the garden, since no wireless signal your laptops, mobile phones, tablet PCs connection can not be established to the internet. ISP provides the WIFI service near your house, but only in the window to capture the signal. You want to install some cameras to ensure property. But because can not erection data line be forced to give up. Two buildings separated by a few kilometers, hoping at the same office network job or share Internet access. Resort operators hope provide Internet access services to yachts, RVs, camper. 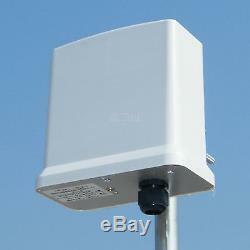 EGASKY company's outdoor AP can solve your problem. Point to Point, multipoint wireless communication; - Wireless Video Surveillance; - Enterprise wireless LAN communication between; - WISP CPE; - Wi-Fi wireless coverage. 2.4G 150M Outdoor AP. Straight-line distance visual point to point high bandwidth communications the best solution; Rate. Mars series, with a high price. Learn Egasky company's other series AP. Find the right solution for you. Equipment 3 common mode (AP, Client, Repeater); Supports WDS. Via multiple AP matching, we can accomplish many difficult tasks. Usually applied 2 between buildings LAN create, share Internet, data, Network Equipment. Establish a wireless base station for nearby residents to provide a stable free/paid wireless internet service. 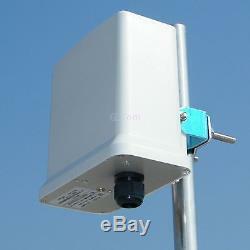 Few km outside video signal real-time transmission to the server, the camera can even be installed in moving vehicles. These are just some simple example, our equipment can work in harsh conditions, play to your imagination, discuss with our engineers. Detailed status display, powerful manage functionality. Customers to easily set up and manage this device. For your company, please contact the sales staff. 64/128-bit WEP, WPA, WPA-TKIP, WPA-AES, WPA2, WPA2-TKIP, WPA2-AES. IP Code (Ingeress Protection Rating). Fully sealed waterproof design, whatever the weather, you can rest assured that the equipment installed outdoors. Range through Ethernet cable, which facilitate the installation of the device away from your house or in open environment. You would have to prepare an extra Category 5e Ethernet copper cable. 8 pin to connect POE power supply and bridge. Although we can prepare this cable for you, but you would be charged for extra. (How to install CPE Poe port Waterproof joint). Because the Bridge function can only be accomplished by using at least two. If you only aim the AP or CPE function, one Bridge package will be definitely all right. You need to have some network knowledge to set up the network, you can ask an experienced friend to help you, also we will try our best to help you to complete the setup. Our network engineers will be happy to complete the settings for you before sending the packages, but you will also be charged some tips for their kindness. Egasky Worked hard Every Day, Give customers Best Product. We will provide tracking numbers after the parcels being sent. Please add another 5-10 days as a delay. If you are dissatisfied with the service, please contact uswe will try our best to solve the problems. The item "Mars_R2416N WiFi Wireless Outdoor Access Point Bridge Repeater POE 16dBi Antenna" is in sale since Tuesday, February 03, 2015. This item is in the category "Computers/Tablets & Networking\Home Networking & Connectivity\Wireless Access Points". toni" and is located in HongKong. This item can be shipped to North, South, or Latin America, to all countries in Europe, to all countries in continental Asia, to Australia.